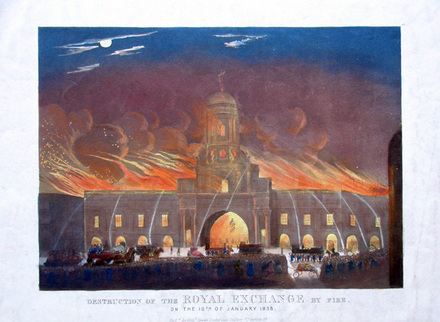 On the night of January 10, 1838, the Royal Exchange, at the corner of Threadneedle and Cornhill Streets in the City of London, burned to the ground. 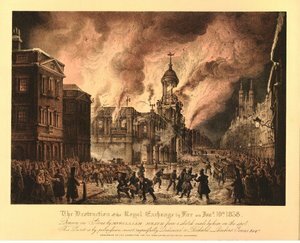 It was one of the most spectacular fires of the 19th century and many artists got out of bed to sketch the scene, including William Heath. At least two prints are derived from Heath’s drawings, an etching published by Robert Havell at his Zoological Gallery [above] and a lithograph published by Rudolph Ackermann at his Eclipse Sporting Gallery [below]. See also: Effingham Wilson (1783-1868), Wilson’s Description of the New Royal Exchange, including an Historical Notice of the Former Edifices … (London: E. Wilson, 1844). DA687.R69 W557 1844.